Hulu is betting big on live sports, and has launched a new brand campaign to drive awareness of its offerings in the space. The campaign, “Hulu Sellouts,” features professional basketball players “selling out” to Hulu, and letting everyone know, in autographs and even tattoos, that “Hulu has live sports.” The first spot has Damian Lillard getting a Hulu tattoo, and the All Star Game spot has Joel Embiid signing all of his autographs as Joel “Hulu Has Live Sports” Embiid. “Do you think you could sign this without ‘Hulu has live sports’?” Asks a fan in the Embiid ad. “Legally… nah,” Embiid replies. 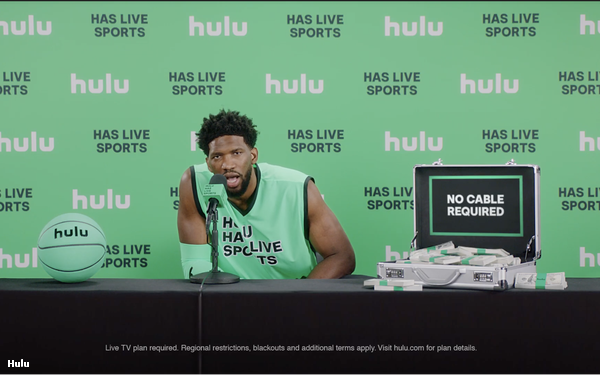 The campaign is meant to drive awareness of Hulu’s live TV offering, which includes streaming live broadcast and cable channels, including ABC, ESPN and TNT, which have NBA TV rights. Streaming services such as Hulu and YouTube TV have been aggressive in their live sports sponsorships, in an effort to let sports fans know they can watch games without a traditional pay-TV package. YouTube has sponsored the World Series, Super Bowl pre-game show, and NBA Finals, while Hulu has sponsored the Stanley Cup playoffs, and is also a sponsor of TNT’s NBA playoffs coverage. The campaign, which was created in partnership with Big Family Table, will feature two additional spots in the coming months, including one with All Star Game captain Giannis Antetokounmpo. The NBA spots will run through June, with additional ads featuring athletes from other sports to follow. In addition to the national TV ads, the campaign will include online takeovers, social media buys, and billboards.